Product information "AC Voltage Monitor"
Simply connect the AC voltage sensor into any available 230V outlet then connect the RJ-12 cable (included) to one of the sensor ports on the Didactum Monitoring System. In the easy-to-use web interface of the Didactum monitoring base unit you can then set the desired parameters and alerts for each sensor individually. You can also measure and record the voltage with this sensor. In the Web GUI you can also display charts with the internal graphing function. These graphs allow you to view a visual impression of the stored measurement data which includes the quick evaluation of peak levels. Max. distance from the unit is 100 meters. All Didactum Monitoring Systems operate independently. You don´t need to install any software to use this network-based instrument. Thanks to the full SNMPv1 / v2c / v3 support the Didactum monitoring appliances can be integrated into most SNMP tools and network management systems (NMS). Also all SNMP-compatible automation and building monitoring software is supported by the Didactum surveillance technology. The necessary SNMP MIB files are included with all Didactum Monitoring Systems. Related links to "AC Voltage Monitor"
Connection Plug 220V is put into the outlet necessary for measurement. 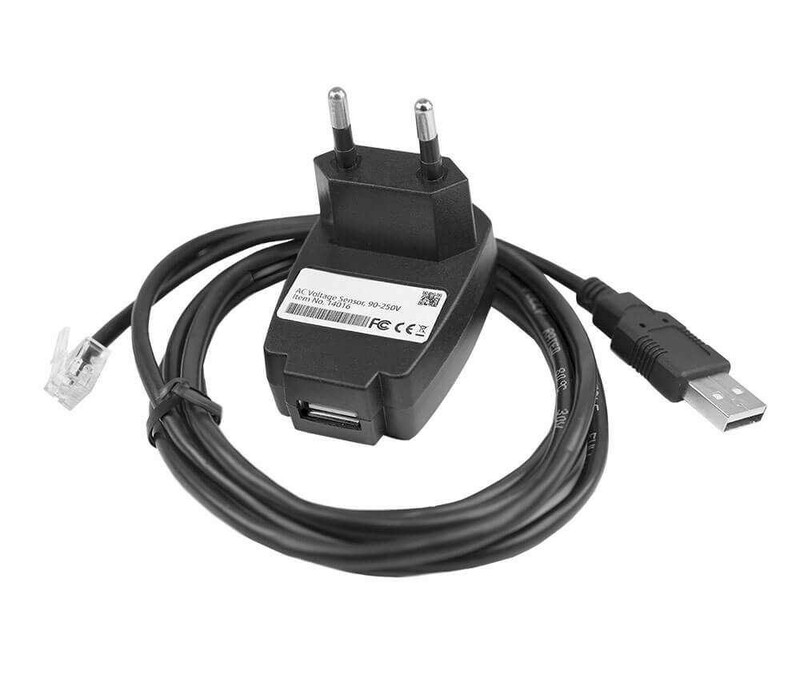 Cable's USB connector must be connected to the USB output, connector RJ-12 must be connected to an analog input of any system unit. Determination of sensor's type and connection occur automatically. Supply includes Sensor and USB RJ-12 patch cable (1.8 m). Customer evaluation for "AC Voltage Monitor"
Wir setzen diesen Sensor AC Wechselstrom erfolgreich ein und sind von der einfachen Installation begeistert. Gruss Petra S.